The Face Shop Ink Lipquid (with the really cute portmanteau in the product name) is the Kbeauty brand's latest lip product, and it is marketed as a cross between a lipstick, lipgloss, and lip stain/liptint. The selling of the Ink Lipquid, according to the Face Shop, is the combination of moisture and staying power. I don't have the website, but reading off my phamplet, the Ink Lipquid promises "moist lips with 70% water base", and a "vivid color lasts on lips for 12 hours" (gotta love that slight Engrish over there, but you get the idea). There are 12 shades in the range, and like most Korean brnds, the colours range from brights to pastels, and cover a fairly good array of colours. 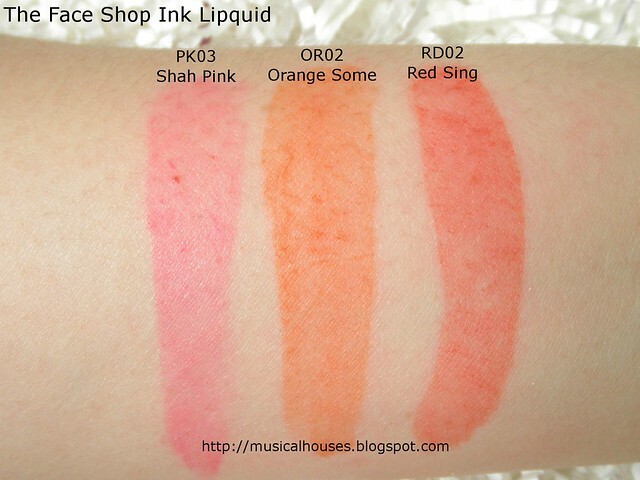 I have 3 of the shades today, PK03 Shah Pink, OR02 Orange Some, and RD02, Red Sing. Alright, let's get on with the swatches and reviews! I've got both arm and lip swatches, as well as an (accidental) staining test! The packaging of the Ink Lipquid is basically a lip stain/gloss-like product with a doe-foot applicator. So although it's advertised as a lipstick, lipgloss and lipstain all in one, it's really not a "lipstick" in the sense that it's not a solid bullet of product. I guess it's more like a liquid lipstick. Let's start off with some arm swatches. Sorry that the swatches are so messy - I struggled a little with the doe foot applicator, and obviously am not that great at making my arm swatches neat! Pigmentation on the Ink Lipquids is layerable, so you can sheer it out or layer it for a more intense colour, but generally they have great pigmentation. PK03 Shah Pink is a sweet wearable pink, not too bright, not too deathly pastel, and not too blue, either. OR02 Orange Some (ooh, pun-y name) is a bright orange. Like, the orange you get in your paint set. Definitely a warmer-toned shade that looks best on girls with correspondingly warm undertones. 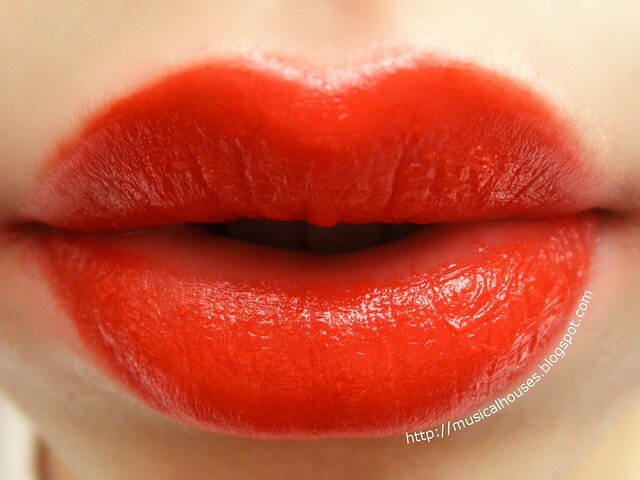 RD02 Red Sing is a kickass neutral fire engine red - good if you're looking for a red lipstain. Now, let's move on to some lip swatches! First, PK03 Shah Pink. As you can see, there is a peek of my natural (and fairly dark) lip colour showing through. I wasn't expecting it to be so wearable on me, but it turned out quite flattering - it does look like a girly shade of pink, and adds some colour while still looking quite natural. I like this, and I can see it looking great on fairer girls. Next, OR02 Orange Some. Orange is just one of those colours that don't work very well on me, owing to my slightly-cool fair olive undertone, so this just wasn't that flattering on me. But, as you can see, it really does pack a punch as a bold, bright colour. Lastly, RD02 Red Sing. This is straight up red. 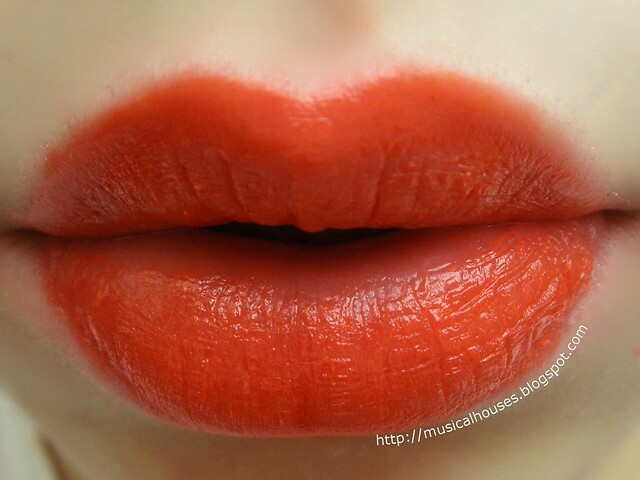 If you're a red lip kind of girl, then you're probably already looking at this shade and thinking, "This is such a pretty red!" And it is. It's also pretty neutral in undertone (maybe leaning the slightest bit warm? Maybe?) so it should look pretty flattering on most people. 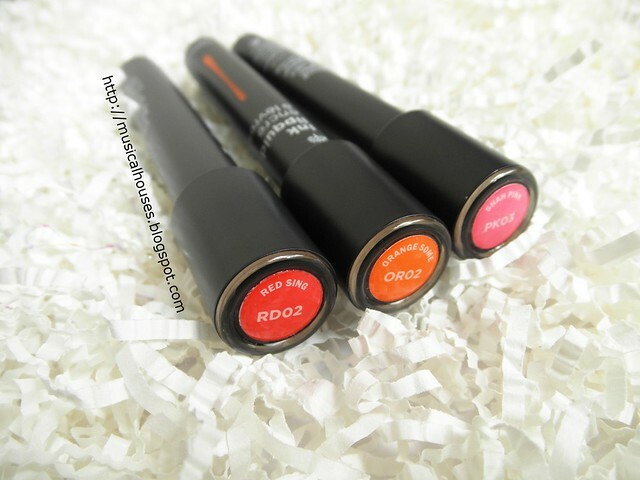 You've already seen the pretty awesome pigmentation on the Ink Lipquids. But, the thing that stood out to me about The Face Shop Ink Lipquids is that they were fairly moisturizing - I'm having a spate of dry lips right now, and most lipstains or lip tints might exacerbate the issue, but the Ink Lipquids actually felt like they didn't dry out my lips. I mean, they didn't feel super moisturizing or hydrating, but since it's a product with staining power, I wasn't expecting it to hydrate my lips (in my experience, there is some sort of trade off between how drying a product is and how long it stains your lips for). I think this is pretty unique in that it manages to balance both good staining power and a fairly moisturizing feel on the lips. 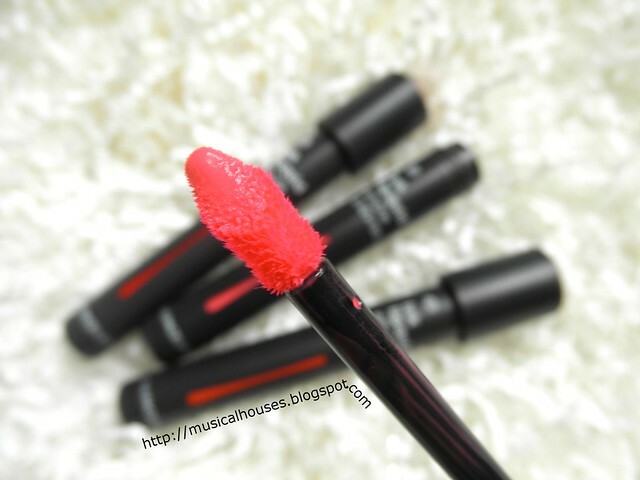 It also feels quite lightweight on my lips - no goopiness, stickiness, or oiliness with these. Also, these do have pretty good staining power. Look at what happened when I tried to wipe off the swatches on my arm! 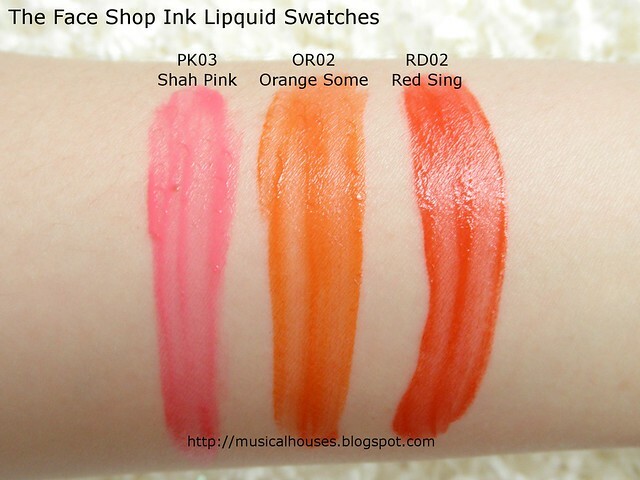 I had swatched these on my arm, then went on to do lip swatches, and then when I returned to try to wipe off my arm swatches, the product had stained my arm skin. (Note to self: next time wipe swatches off immediately!) So, yes, this does stain, although you do need to give it some time to "set" - if you drink a cup of water straight away after applying these, the product will just bleed into your drink. I'd recommend waiting for the product to "dry down" on your lips if you want to be safe. So, would I recommend these? I would! Between the pigmentation, the staining power, and the non-drying, lightweight texture, I can't find anything to fault these. I guess the only con is that I found a very neat application difficult with the doe foot applicator (hence the messy lip and arm swatches). So I wouldn't attempt to apply these in a moving vehicle, especially with the more pigmented shades. But otherwise, at S$17.90 each, these are really quite inexpensive for a good quality product with a cute name. 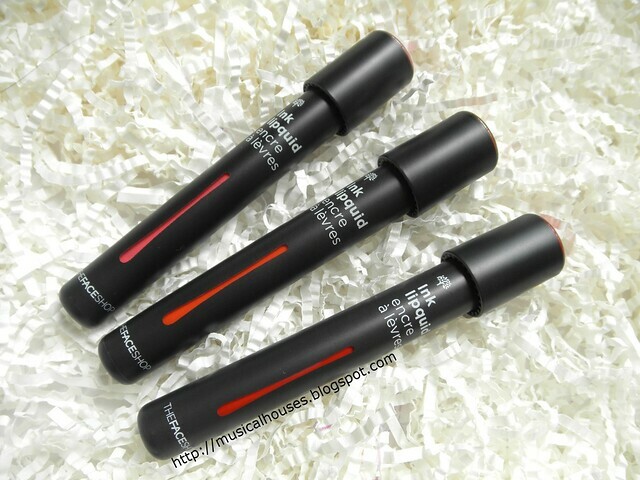 The Bottom Line: The Face Shop's Ink Lipquids have great pigmentation, staining power, with a non-drying, weightless feel, making them a great value-for-money buy. These look awesome! The staining power is impressive! I am on the hunt of non-drying tints, I think these will be next.